Three years after Roseman and Davis sojourned at Mellifont Abbey, they received news from Father Thomas, archivist and librarian, who in ongoing correspondence writes to say: "Dom Enda's term of office having expired we had an election and who should be elected but Father Finnian so well known to both of you." The letters and cards from Benedictines, Cistercians, Trappists, and Carthusians constitute an important documentation on contemporary monastic life as well as an extraordinary correspondence between an artist and his models. "The drawings are truly magnificent and a splendid gift for this abbey. We will be forever in your debt. In due time I shall have them framed for the admiration of not only the community but of everyone of note who visits the monastery. . . .
"Though into October the weather in this part of the world is still very mild. We are getting our share of rain and to that extent it is typically Irish weather. Our two new novices are settling in fine so our hopes of survival are more optimistic than when I last wrote. Small Brother Peter is in hospital after, above all things for one so slim, a heart attack. Br. Dominic is also in hospital. Apart from those we are all in the best of form. "We were really pleased to learn of the success of the exhibition at the Albertina. . . . Our sincerest wish for you is to earn even more success. . . .
Abbey of La Trappe, 1979. "I have been very happy to receive your kind letter with good news of both of you and can see that everybody and every country in Europe is especially fond of your work (and of the workers). . . .
"None of us here has forgotten both of you and all send best regards. Life goes on, unchanged, in the presence of God Who is the reality of each instant. "With my Love - and God bless you." The first letter of invitation from a monastery in Ireland was from Father Finnian, seen in the drawing at the top of the page, who was guestmaster at the Trappist Abbey of Mellifont, in County Louth. Mellifont Abbey dates from 1142 with the founding of the first Cistercian monastery in Ireland. Father Finnian writes to Davis: "My Abbot Dom Enda Ducey has asked me to reply to your letter of April 10th. We will be very happy to welcome you and your friend Stanley Roseman to our abbey. . . .'' The Guestmaster thanks Davis for the enclosures he sent about Roseman's work and thoughtfully mentions that if they are not traveling by car, there is good public transport from Dublin. Father Finnian closes: "Looking forward to meeting you and your friend." Roseman and Davis' first sojourn at the Abbey of La Trappe, in Normandy, was in the spring of 1979. Frère Élie (Elijah) writes in a cordial letter of invitation on behalf of the Abbot Dom Gérard and the Community: "It is with great pleasure that we shall receive your friend Stanley Roseman and yourself in our monastery." Founded in the twelfth century in Normandy, the Abbey of La Trappe is the birthplace of a rigorous reform of Cistercian monasticism in the seventeenth century. The reform gave rise to the Order of Cistercians of the Strict Observance, also known as the Trappist Order. Roseman recounts: "Years before Frère Élie entered the Abbey of La Trappe, he had worked in the Far East for an international company, where he learned English. At La Trappe that spring and on a return to the monastery that summer of 1979, Frère Élie invited me to visit him at his post at the gatehouse. I was grateful to have wonderful opportunities for enlightening conversations with him as well as to draw several portraits of the kind and erudite monk who had befriended Ronald and me." "All your friends here at La Trappe join with me to send to both of you their love; unfortunately (or fortunately for him) one is now missing - Father Jean has come back, on Saturday 21st of May, Whitsuntide's eve, to his God and Father, and we have taken him to his last resting-place, the day after. But he is not really missing; he is still with us another way. "The right manner of speaking is 'a monk at Vespers' (or at Mass). . . .
"God bless you and with my love." "Ever so many thanks for both your letters (i.e. one each). I was glad to hear you've settled down at Ramsgate. "Delighted to get your very kind and affectionate letter - have very pleasant memories of your visit - always welcome - just had a big celebration - Platinum Jubilee of 70 years being a monk of Mt St Bernard. Will be 91 soon but feel very young about 20. God bless you both." "It was warming to have your appreciative remarks about your time here. . . . It was an exciting time. Posterity will benefit from your work. . . ."
I am deeply affected that still now after so long time you do not forget me. I too wish you a joyous and graceful Christmas and a happy new year in best health. "Now, don't be terrified on account of what I will tell you. I-self was not frightened at all, for my-self it was merely a decisive turning-point in my life. "This happened last year in the night from 12 - 13 August, Saturday to Sunday. I was in church singing with our community the night-office. "Whilst I was singing with fervor during 3 hours, at the same time I was dying and dying I sang. Singing I died, and dying I sang! Can you figure something like that? I-self can not describe it. After that night I have been until ending of September by day and by night without interruption dying. However this death which I passed through was not a physical death and did not at all hinder me to execute all my daily duties. I made even during that time big works on the roofs. I was not feeling some particular tiredness. Only I had the strong feeling of a progressive detachment from all earthly things and I finished to be absolutely without any earthly needs and desire, to need and to desire God alone. The more I was detached from everything, the more I progressed living a new life with God alone in infinite joy and peace. "That's my great event of last year 1989. This year 1990, I am still living on our earth, but like a foreigner and wanderer, whilst my home by God is. I am still working, as servant for God and our house, as long it is pleasant to God until He calls me to Him. "I continue to sing with the birds in love, joy, and peace and remember you in my prayers, that God may grant you both a joyful Christmas feast and good new-year 1991 in best health, and all good things. "We have just made our annual retreat, which lasted a week. This deepening of the spirit costs - but anything worthwhile does - and I hope my resolves will last, with God's help. We talk about outer space and 'light years' etc. But the journey inwards is the longest - (did I tell you?) and it takes just as much courage. The soul is greater than the cosmos and few explore it. We won't take time! Great generosity is demanded and not being ready - we put it off - so you see it's a life's work. . . . 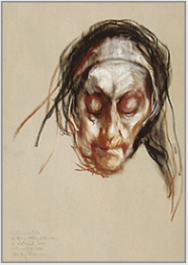 Sister Immaculata, 1983, a portrait of a Trappist nun in prayer, was acquired in 1986 by the Teyler Museum, in the Netherlands. The museum houses a renowned collection of master drawings from the Italian Renaissance, including sheets by Michelangelo and Raphael, and from the seventeenth-century Dutch school, notably drawings by Rembrandt. Roseman was given the extraordinary privilege, due to his work on the monastic life, of being taken inside the cloister to draw the Trappist nuns. As with Mother Imelda, Sister Paula was equally encouraging to the artist in his work and thoughtfully introduced him to members of the Community to draw, among whom was an endearing elderly nun Sister Immaculata, whose superb portrait is presented here, (fig. 8).
" - at breakfast and supper - self service - each monk helps himself according to his desire, but there is neither eggs nor fish, and of course no meat. "and fasting time - from Sept. 14th to Easter! (not on Sundays and feast days)." Frère Élie is seen here in Roseman's beautiful drawing of the Trappist monk at Vespers, (fig. 4). 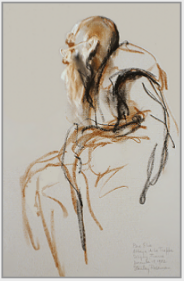 The artist draws in bistre and black chalks to describe the voluminous cowl and adds touches of white chalk in the fine detail rendering of the monk's face, eyeglasses, and flowing beard. Frère Élie, with the long sleeves of his cowl covering his hands in reverence to God, recites the Pater Noster. 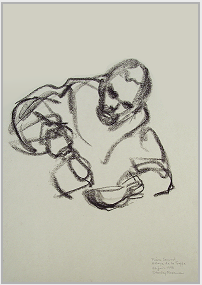 At La Trappe Roseman made a series of wonderful drawings of the monks in the refectory while they took their meals, as with Frère Samuel in the Refectory, 1997, (fig. 5). 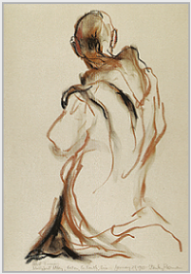 With calligraphic strokes of black chalk, Roseman has captured both the attentive regard of the monk and the movement of a routine gesture as he leans forward, lifts his right arm, and pours from a pitcher into his bowl. At La Valsainte, Roseman was invited by the Prior to draw the hermit monks when they gather in choir for Vespers in the late afternoons and for Vigils, the ancient time for prayer, singing the Psalms and keeping watch in the night. The drawing of Brother Louis entitled A Carthusian Monk at Vigils, reproduced below, (fig. 7), is conserved in the Musée Ingres, whose outstanding collection grew from the bequest of the French master Jean-Auguste-Dominque Ingres (1780-1867) to his hometown of Montauban. 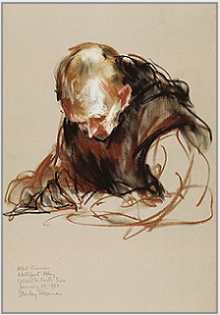 In the drawing A Carthusian Monk at Vigils, Roseman's subtle gradation of the single bistre chalk in rendering the hermit's face and beard complemented with broad strokes that define shadows from the fall of light on the Carthusian monk's hood, down his shoulder and arm, and under the sleeve of his habit. 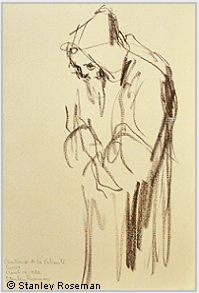 With an economy of line, Roseman has created a beautiful and deeply felt drawing of the hermit monk at prayer in the night. Over the course of more than forty years since Stanley Roseman began his work on the monastic life, monks and nuns have corresponded with the artist and his colleague Ronald Davis. 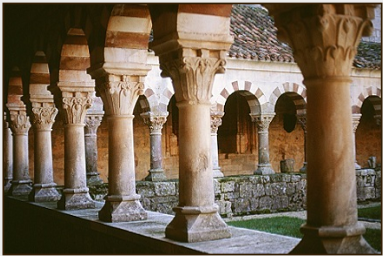 The extensive correspondence recounts events in monastic communities, provides information on specific monasteries and monastic regulations and observances, offers commentaries on monasticism and spirituality, speaks of an individual's studies and work assignments, and relates personal experiences and reflections in following a life centered on contemplation and prayer. In letters and cards, monks and nuns expressed their enthusiasm and appreciation for Roseman's work. "If I have done anything to further your project, I am only too delighted. I hope the work goes from strength to strength. In the meantime, All the best & with much affection." Roseman painted the marvelous oil on canvas portrait of Father Benedict seated on the balcony of the monks' dormitory on the second floor of the Abbey. Father Benedict, Portrait of a Trappist Monk, 1978, (fig. 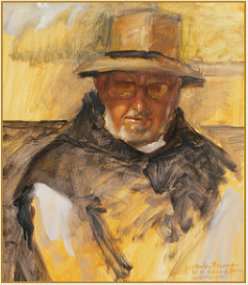 6), depicts the eighty-four-year-old Scotsman wearing his gardener's hat, which shades his white-bearded face from the bright summer sun. The artist has composed the painting with geometric abstractions in the division of pictorial space and depiction of the shapes of the Trappist monk's black scapular over a white tunic and his broad-brimmed hat. Vigorous brushstrokes well express Father Benedict's lively personality. Roseman finely renders the elderly monk's face, his ruddy complexion from hours of work in the orchard and garden, his eyes glancing out from behind thick-lensed eyeglasses, and his mouth about to speak a few friendly words to the viewer. In the Cistercian Order's ninth centenary year, Roseman and Davis returned to the Trappist Abbey of San Pedro de Cardeña, in Castile, where the artist had drawn the monks nineteen years before. 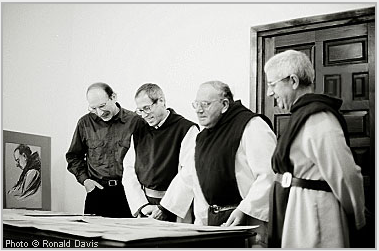 Roseman's work at San Pedro de Cardeña in 1998 spans a six-week period from mid-November through late December for the artist and his colleague were invited to spend Christmas at the Abbey and for Roseman to draw the monks at Midnight Mass and at the Divine Office on Christmas day. 9. The eleventh-century Romanesque cloister of the Abbey of San Pedro de Cardeña, Castile. 1998 marked the 900th anniversary of the founding of the Cistercian Order. Cistercian monasticism today comprises two branches: the Order of Cistercians of the Common Observance and the Order of Cistercians of the Strict Observance, or Trappist Order. "Dear Mr. Stanley: I have received your letter of October 19. You can come on the dates that you specified in your letter, during the month of November. I am happy to welcome you and Ronald to the Monastery, and your return will bring back memories of the days you were here several years ago. 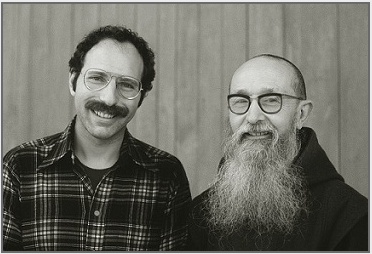 Cordial greetings,"
Responding to a letter from Roseman, Abbot Marcos writes to the artist in September 1999 to thank him for saying how much he and Davis enjoy the music cassettes and to reaffirm the Monastery's appreciation for the gift of the drawings. "And we are also very grateful for your generosity on having donated a selection of your drawings, which will be a great collection for our Monastery. "For my part, I am glad that you enjoy the cassettes of music we sing here at home. Listening to the music will be for you a remembrance of the days that you were with us. "I send you and Ronald my affectionate and cordial greetings." Sister Paula, Sub-Prioress at St. Mary's Abbey, Glencairn, and a graduate of Dublin Art College, corresponded with Roseman from after their meeting at the monastery in 1978. Glencairn, a Trappist abbey in County Waterford, was the first convent in which Roseman drew in the early months of his work. Abbess Mary Imelda had written in her cordial invitation: "You will be very welcome.'' The Abbess and Sister Paula graciously received Roseman and Davis at Glencairn in August 1978 and again on their return to Ireland in winter of 1983. "May God be with you on your journeys. Shalom." Abbey of San Pedro de Cardeña, Burgos, 1998.
for a gift offered by Roseman and Davis to the abbey. Abbot Marcos, a kindly man in his late fifties, was very welcoming and a gracious host to Roseman and Davis. The Abbot and Community's enthusiasm for the artist's work made for a memorable sojourn and enriching experience. San Pedro de Cardeña provided Roseman with inspiration for a series of excellent drawings at the Spanish Trappist Abbey in the ninth centenary year of the founding of the Cistercian Order. Trappist Monks in Choir, (fig. 11), was also selected by the Abbot and monks for the Monastery. 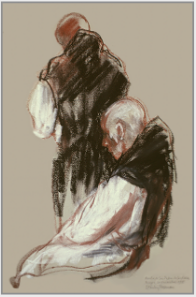 In the artist's striking composition with complementary passages of black and white chalks, the younger monk stands facing the altar; the older monk, seen in profile, is seated, each absorbed in personal prayer and meditation. Abbot Marcos thoughtfully gave Roseman and Davis Christmas gifts of three recordings of the monks singing beautiful chants for Lauds, Vespers, and Compline.